When I added Dolby Atmos surround sound to my home theater a few months ago, I expected that to be the last major upgrade that I would tackle for a while. However, as these things usually go, making one big change inevitably prompted even more. Is it ever possible to be happy with what we have? In my case, wiring my home theater for 7.1.4 channels of surround sound made me question the adequacy of some of my speakers – especially my center channel speaker, which is tasked with reproducing the majority of dialogue and significant portions of any movie soundtrack. I realized that this was a problem when I played a mono movie and found myself disabling that speaker in order to split the mono signal to my left and right front mains instead. If I’d had a better center channel, I shouldn’t have had to do that. As I explained in my prior post after I made the Atmos upgrade, upgrading speakers is a little tricky for me, because all of the speakers I have are from a brand (Cambridge Soundworks) that isn’t even in the home theater market anymore. The company doesn’t make home theater speakers at all now. Fortunately, I’ve had a lot of good luck finding used Soundworks speakers for reasonable prices. The company used to have a big retail presence in my area, so its products (even high-end speakers) turn up pretty regularly on Craigslist and eBay. Previously, I used a model MC300 speaker for my center channel, as you can see in this old photo. I have now moved up to the MC500, which is significantly larger and more powerful. Just look at how much more space it takes up on that stand, for starters. My front soundstage sounds a lot better now, not just for the rare mono movie but for everything I watch. This was a worthy upgrade. That wasn’t the end of my changes, though. Replacing the center channel then triggered a chain reaction. Because I was left with a spare MC300 speaker that I didn’t want to put to waste, I next hunted down a second MC300 in order to replace my left and right Surround channels (formerly MC200s). I then had to decide what to do with those MC200s, and that was especially complicated. 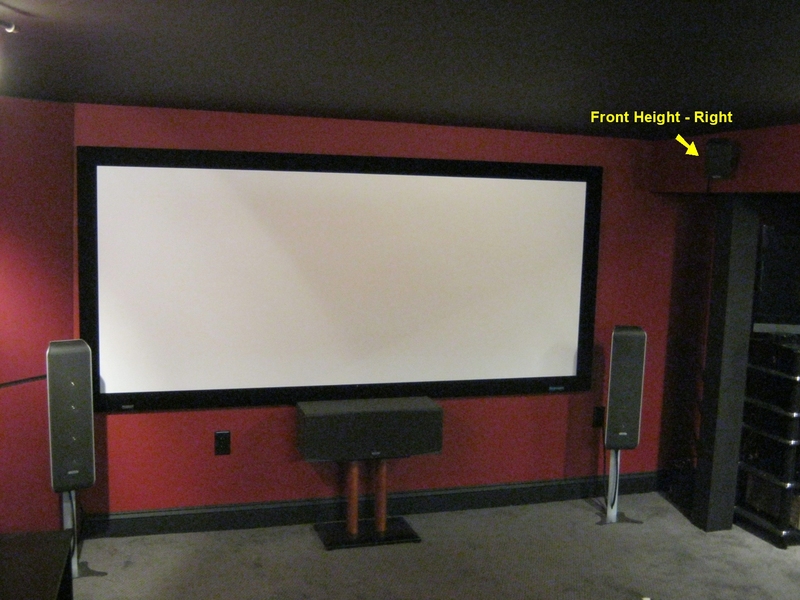 When I initially installed Atmos, I had to make some compromises in speaker placement due to the way my former 7.1 system had been wired and installed when I built the home theater room. One thing that left me particularly unsatisfied was that my Surround Back channels were mounted to the ceiling in the back of the room. In an ideal Atmos configuration, all 7.1 of the base layer channels should be at or near ear level, whereas I had the Surround Backs on the same plane as the height channels. Having the other 5.1 speakers at ear level but the Surround Backs up high created an imbalance in the soundstage and a lot of confusion in sound objection directionality. Say you’re watching a movie where the sound of a car zooms from the front of the room to the back. In my system at the time, the car would start at ear level in the front, move to ear level at the sides, and then suddenly shift to up high in the back. While not every movie had problems like this, it was enough of an issue that I wanted to change something. What I decided to try was a little unconventional. First, I took those spare MC200 speakers and put them on a shelf behind my seats, just slightly above ear level but close enough to being in the same plane as the other 5.1 channels. That sounds simple and logical enough, right? Indeed, it works out much better for me. However, it also means that I had two speakers mounted to the ceiling in the back of the room that weren’t being used. I now had six speakers mounted either on the ceiling or up high on the side walls: two in the front of the room, two in the middle, and two in the rear. My A/V receiver, the Denon AVR-X5200W, can only decode four height channels, for a maximum system configuration of 7.1.4. Yet I had 13 speakers wired, mounted and installed – enough for 7.1.6. Currently, only super high-end boutique hardware costing tens of thousands of dollars can decode more than four height channels in Atmos. That was simply out of the question, but I still wanted to find a way to make use of all my speakers and most effectively distribute sound through my room. Otherwise, I’d have to pull down one pair of the speakers (either Top Middle or Top Rear), or simply leave them disconnected, a purely ornamental feature in the room. Not only does that seem wasteful, but it would potentially leave a gap in the upper hemisphere of the room with no sound at all. Ultimately, I chose to rewire both the Top Middle and Top Rear speakers and connect them in parallel to one set of posts on my amp. Essentially, this forms a small speaker array by cloning one pair of speakers and copying the sound to the other pair as well. The system still only has four discrete height channels of audio, but spread among six speakers. I suppose you might call this a 7.1.4 (2) configuration, if that weren’t such a mouthful. Doing so left me with a concern about whether cloning one set of speakers would disrupt object directionality in the heights. Would a sound that’s only meant to come from the middle of the room sound weird if it came from both the middle and back simultaneously? I also wasn’t sure whether it would be better to program this new speaker array as Top Middle or Top Rear. Would that matter at all? To test the new system configuration out, I found a very useful scene in the Atmos Blu-ray of the movie ‘John Wick‘. At approximately time code 1:25:10, the sound of a helicopter pans through the height channels from front left to rear left, and finally over to rear right. I disconnected all of my speakers except the height channels and listened to this scene over and over again, switching between the Top Middle and Top Rear settings in my receiver. What I determined is that there’s effectively no difference between those settings. The movement of the helicopter was identical no matter which I picked. Further, cloning the two pairs of speakers sounds great in my room and doesn’t compromise the object directionality at all that I could tell. Satisfied with those results, I plugged the rest of my speakers back in and have been watching movies and TV that way ever since. I think they sound terrific. Moving the Surround Back speakers down to the same level as my Front Mains and other Surrounds made a pretty noticeable improvement on its own, and the heights are better distributed as well. If, at some point in the future, I ever upgrade to another A/V receiver that can decode six height channels, my speakers are in position and wired up, and can be easily connected that way. My only disappointment is that I was forced to put the Top Middle set of speakers high on the side walls rather than on the ceiling. (Those had previously been my main Surrounds. They were already wired and mounted in place, and can’t be moved now.) I fear that I don’t have enough distance between those speakers and the new Surrounds below them, and that I’m left with a gap directly above my head. As a result, that helicopter pan seemed to bounce from one side of the room to the other, and a later rainstorm scene in the movie sounded like it was falling in a ring around me, but not on top of me. That’s a compromise I had no choice but to make due to the circumstances of how the room had originally been built. It’s not ideal, but fortunately it’s rarely problematic in practice. I can live it it. Overall, my home theater sounds better than it ever has before. I’m very pleased with the Atmos investment and the new speaker arrangement. Am I done yet? Probably not. I’ve lately been monitoring Craigslist for a good deal on a pair of nicer tower speakers for my front Left and Right mains, which would probably also mean swapping around some of the other speakers (my old Left/Right mains moving to the Surrounds, those Surrounds moving to Surround Back, etc.). Once this upgrade itch gets started, it takes a lot to scratch it. That new center channel looks much better with all your gear. Glad it’s worked out for you. How is your low end? Do you think you’ll be looking into a new sub or adding more subs to your theater after your other upgrades, or are you pretty satisfied with what you’re getting now? I’m generally satisfied with my subwoofer (which isn’t visible in any of these pictures), but honestly, I’m not a bass fiend. I like a resonant low end, but find house-shaking bass to be obnoxious. With that said, I had some problems watching John Wick where my sub would thump distractingly during certain low-end hits. It didn’t pop, but the sound was far too localized to the sub location behind my seat (whereas the bass should be omnidirectional and feel like it’s coming from all around). I have not had that problem with any other movie I’ve ever watched, so I’m hoping it’s either something specific to that disc, or something that can be tamed by adjusting my crossovers and EQ. The main reason i want a new sub is for that reason. I want more power, tighter and lower bass, but I just mainly want my sub not to bottom out. With certain movies, my current sub rattles and gives away its position which is very distracting. It doesn’t happen often, but is quite an earsore when it does. Thank you for this. Very entertaining to read how things progressed for you. As a store manager for CSW for 9 years it’s wonderful to see professionals enjoying some of their amazing products. I too use the MC500 center channel and would have an incredibly difficult time replacing it (even though I work somewhere where I am around very nice high end speaker products). In fact at one point my young daughter, pushing buttons on my receiver accidentally turned off my front speakers and it took me about a week to notice because of how much sound comes out of that speaker. I also use 4 MC300’s as my surrounds and surround backs in a 7.1 configuration. I will keep your experiences in mind should I ever end up with a new amp and take the step into Atmos. It’s a shame what a downturn the company took. They made some really great speakers. As someone familiar with the product line, I’d be interested to hear your thoughts on the older Tower and Tower II models versus the later Newton range of towers (from T100 to T500). Agreed. Without getting into the inner workings too much of the demise of the company, the products always spoke for themselves and the quality at the price was second to none. The tower 1 & 2’s were great musical speakers. They were designed to be an amazing pair of speakers (I always preferred the excellent imaging of the tower 2’s over the bi-polar sound of the tower 1’s). When the time came they were shoehorned into a HT environment because that’s the way the market was going but there was no cohesive product line to support the original towers. Don’t get me wrong speakers like the original “center stage” or “center channel plus” or the bi-pole/di-pole surrounds were great speakers at the time, they just never quite gelled the way the later lines would. The Newtons were designed from the ground up to be more of a HT environment. They had matching tweeters midrange and woofers to ensure that kind of mindset. I own the t200’s as I was more interested in a separate powered sub over the dual powered subs built into the main channels. You could of course set them up to be discrete but, in my opinion lost out on some of the full range stuff that should be coming from right and left by it being mixed with the discrete channel. My preference on the originals vs Newtons really comes down to application. I’m looking for new towers to blend with the other speakers I have. What you describe is what I assumed, that the Newtons would be better suited for that purpose. I saw a pair of T100s advertised on Craig’s List, but I’ve been holding out for T200s to turn up. Right now, I’m using MC600s (the so-called “HD” speakers that were designed for mounting next to a flat panel TV). They’re good speakers and have served me well, but I feel like I could get a little more oomph from something with larger drivers. I absolutely love the T200’s. While the T100’s had a bit beefier sound than the MC600’s, they were a very small tower and personally I prefer the sound from your MC600’s between the two. I actually purchased a new amp about a year ago (of course before the Atmos stuff started rolling in) and I’d never heard the 200’s come alive like that before. They sound better now than they did when I walked out of the store with them 9 years ago now. Definitely worth keeping your eye out for and they would sound superb with that Denon piece. If you care, here’s how my set up looks. I guess I’m just going to have to wait for some T200s to turn up on Craig’s List. I figure that’ll have to happen eventually. That’s the thing isn’t it? Companies such as Bose continues to put out overpriced product that are mediocre in performance. But they make so much money they can afford to buy more advertising and name recognition. Ask anyone and they probably have heard of Bose. But only very few have even heard CSW. I can say the same with Beats headphones. Direct marketing does have some disadvantages. I always thought CSW should have created a line of super expensive speakers that are the same as the cheaper ones they sell but added with bell and whistle. At least they make it to Stereophile magazines. Just saw you worked at a CSW store for 9 years. Would like your thoughts. 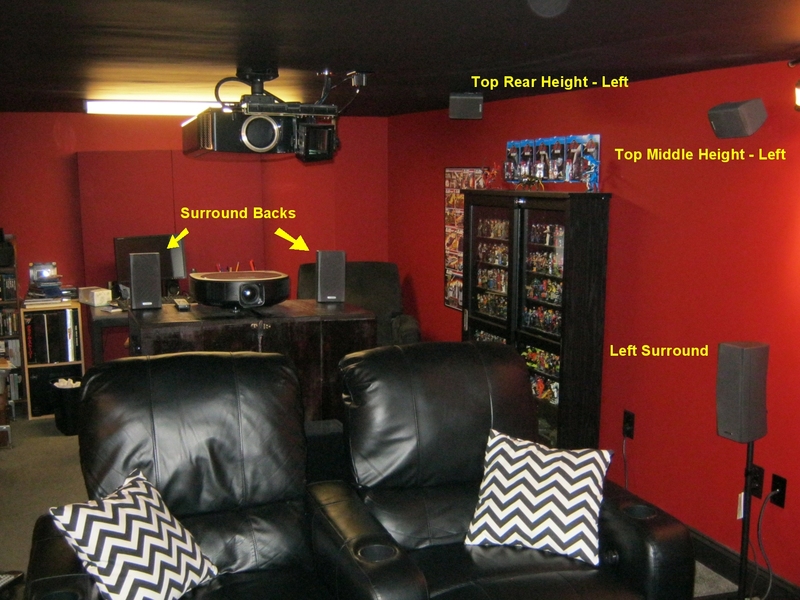 Man cave: Recently purchased a CenterStage, 2 – Tower I, 2 – Tower II, 2 – Tower III and the CSW 12″ downward firing base. All were rarely used, well cared for and in perfect condition on CL for less than $500. Going for Atmos setup and found a great deal on 4 – MC500 for ceiling front and rears. Are they compatible with Towers and would you recommend. Driving them with Yamaha rx-a3050 and external amp for two rear ceiling. The 7.1 system sounds incredible compared to my 3 – MC630HD fronts and 2 – MC305. Would use these but need for living room. You sure you have your model numbers correct? 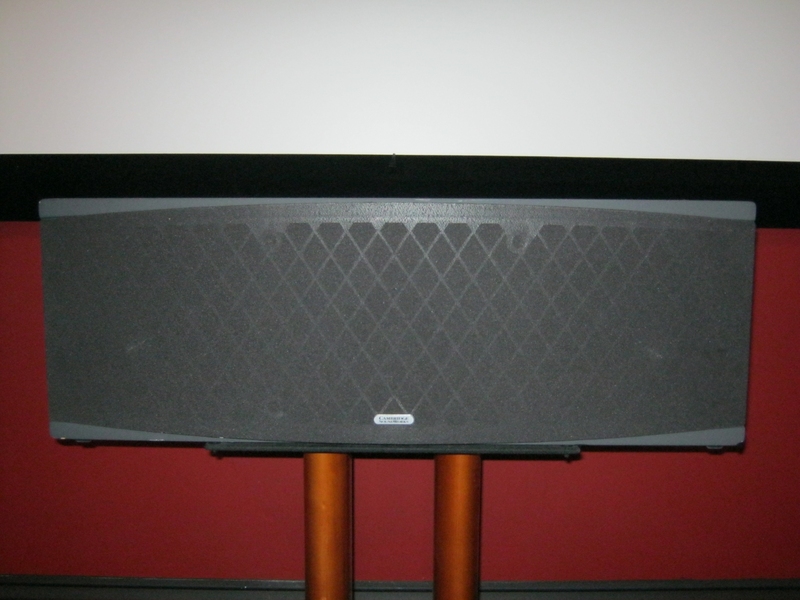 The MC500 is the large center channel speaker. Each one is 26″w x 10″d x 9″h and weighs 27 lbs. I should hope you’re not going to try to mount those to your ceiling! Perhaps you mean the MC50? Josh did you start out with an apartment or small home? I notice your fronts are the only “large” speakers in the setup. Sure an ideal setup would have similar sizing all the way around. The Cambridges do a lot for small box big sound? If you get the upgrade itch again would it be to make the back ones the same models as the fronts? Yes, I started in an apartment. If I upgrade to tower speakers in the front, I’ll move my current left/right mains to the Surrounds. 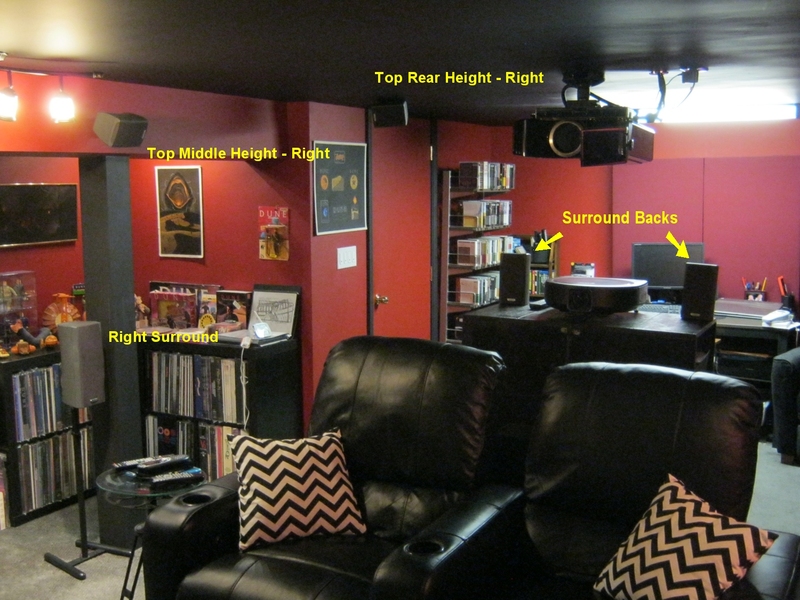 However, I’m not convinced that I really need large speakers for Surround Backs – and certainly not for height channels. For what it’s worth Josh, I swapped my Paradigm Reference Studio 20s (slightly bigger bookshelf speakers than yours judging by the pictures) from the front to surrounds in my 5.1 setup when I purchased the the Studio 60s and I found the 20s more than capable as surrounds in a big room. I’m sure using your tower speakers as surrounds would sound fine, but seems like it would be a tad overkill. Personally, if I bought some new front speakers I’d move my old towers into another room to use as a nice 2 channel stereo system for music. Hehe. Well then teach your kids the joys of listening to the Muppet CD on a nice stereo system. It’s a good learning experience too as it teaches them what happens to speakers when they try cranking it up too loud. 🙂 That’s how I learned when I was a young kid. Just wanted to find up how high Mr. Mister could go and boom! farewell dad’s expensive speakers. As you can imagine, he was quite thrilled with my experimentation. Kidding aside, then moving the towers to the side surrounds is probably the best choice. Also, can I inquire as to what the bluish thing is (are?) between the top rear height – left and top middle height left speakers above the black bookshelves? Is that some kind limited edition blu-ray set or a poster? That figure collection is amazing! Those ReAction figures have me really torn. In some ways they are not well molded BUT the fact they make figures based on my favorite movies and TV shows really appeals to me. I’d love to make a nice investment in them (the classic Universal monsters and Big Trouble in Little China ones really call to me) but there are almost too many of them. I’d love to make one huge purchase and get them all at once as inevitably when I buy a couple the rest won’t be available anymore once I am ready to buy more. But seriously, those GI Joe’s make me envious. The only “ReAction” figures I like are the Alien set, because they’re based on real unused molds created in the 1970s. Although sculpting quality is primitive by modern standards, the designers made a legitimate effort to capture the likenesses of the actors to the best of their abilities at the time. All the rest of the ReAction lines are brand new molds made by completely different people in an intentionally chintzy fashion as some sort of ironic hipster statement. They didn’t even bother to license the likeness rights to any of the actors. I think most of them are terrible, and look more like Playskool than vintage Kenner. To reproduce the exact same sound front and back, I don’t see how it is possible with different sized speakers. You reference a helicopter flying overhead but making the same sound in different boxes/drivers has *got* to sound different. Unless you have all the speakers in a “small” configuration and have a sub do all the low freq work. I would have to agree with you there Krawk. In general, I’ve found that even if you get everything measured perfectly, there’s still going to be some minor differences when sound is sent to the surrounds. In my setup, all my studio speakers are supposed to be timbre-matched. However, even after a professional calibration to fine tune my setup, I can still detect a very slight change in the sound when it hits the surrounds… most noticeably when dialogue is spoken. However, it’s such a minor variation that it’s never really been an issue. Thanks for the link Josh. I remember now you talking about that. Very cool. All of my speakers are set to Small, with bass crossed over to the subwoofer. Theory is one thing, but at a certain point you have to be practical. 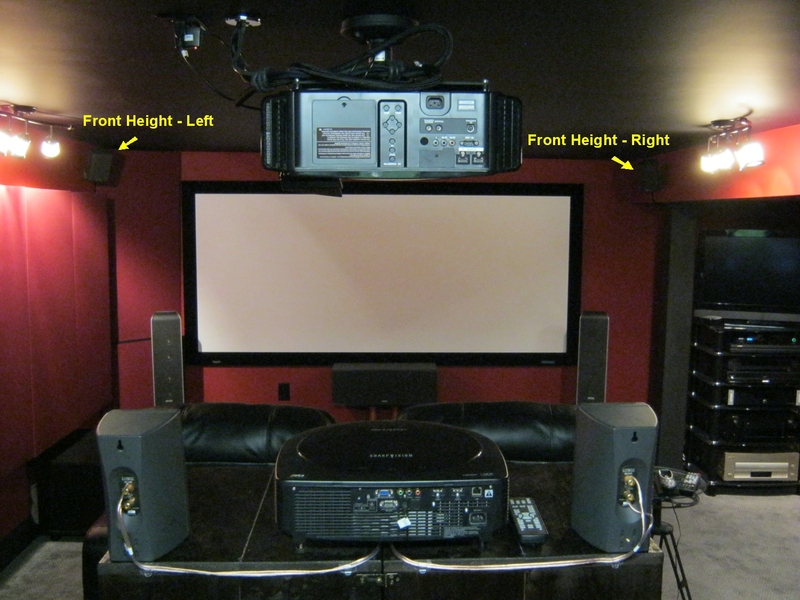 Are you going to mount full-range tower speakers to your ceiling for every height channel? No, you are not. Agreed, although I’d like to see pictures from the person crazy enough to try that. WOW! Lol. That guy would try to ceiling mount tower speakers. I can’t even imagine the hell it would be to have to troubleshoot that system if something went wrong. 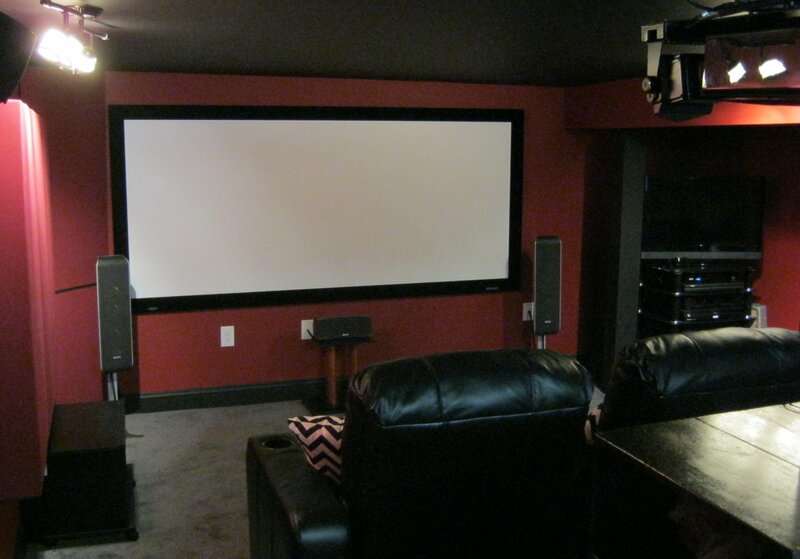 For the record, I think that Kipnis Home Theater is ridiculous. I actually think that trying to watch a movie in there would be hugely unenjoyable. Are we going to see you doing the Atmos reviews on the site soon? I don’t have much time to do Blu-ray reviews these days. That’s a big time commitment. Is that center-channel stand a Sanus NFC18? If so, would you mind telling me how deep that top plate is? It looks like your new center-channel speaker is quite a bit larger than the top plate for the stand. Has that been a problem, at all? I just purchased a new center-channel speaker that is 14.51 depth, 31.13 width, and 33 lbs. I’m hoping that I don’t need to get a new stand. The NFC18 says that it accommodates speakers up to 25 lbs. Do you know how much your center-channel speaker weighs. My hope is that if your center channel is wider, deeper, and heavier than your stand accommodates, but you haven’t had any problems, I’ll be okay, as well. I’m traveling to his weekend but will respond in more detail when I get home in a couple days. You are correct about the stand model. The larger speaker has not caused any issue at all. Okay. Thank you. If you could just give me the dimensions and weight of your center-channel, and tell me if you have ever felt that it wasn’t 100% sturdy, sitting atop something that it is larger than, that would be awesome. I would really appreciate your thoughts. The stand I bought is technically the Sanus NFC18B. Don’t know if that’s any different than the regular NFC18. The top plate is 14″W x 8″D. My speaker is 9″H x 26″W x 10″D. According to the published specs, it weighs 27 lbs. I have had no problems whatsoever. The stand seems pretty sturdy. I think it could support another 5 lbs without issue. However, your speaker also has larger dimensions than mine, so I can’t be certain it would hold it without toppling. The base is 18″W x 12″D. I think you would probably be OK, but I can’t guarantee that or be held responsible if it doesn’t work. Hey josh, so your denon receiver cannot be upgraded to Dts: x through firmware? I’m waiting for a denon receiver just like yours but can also decode Dts:x. If not then hopefully this fall they’ll release one. The only DTS: X Denon receivers that have been announced for 2015, so far, are only 7.2 channel. That means they won’t be able to do 7.1.4, even with a separate power amp. You’ll probably have to wait until Fall/Winter. The current flagship Denon X7200W can do 7.1.4 with a separate amp, and is the only 2014 Denon model confirmed to be getting DTS:X via a firmware upgrade at the end of the year. Are you certain that this has been confirmed? Everything that I can find, in regards to this, states that it’s rumored to getting a DTS: X Firmware update, but nothing is confirmed. Where did you get something concrete? The Denon X7200W and Marantz AV8802 are confirmed to get DTS:X by firmware update and an HDCP 2.2 upgrade by physical board replacement (i.e. you’ll need to ship the unit it for modification to get the HDCP part). It does not look like any of the other 2014 Denon or Marantz models will be upgradable, unfortunately. I highly doubt that DTS: X is going to make much of a splash, in the market. It’s not in theaters, and no films have been natively mixed/engineered in the format. I’m putting all of my chips on DolbyAtmos. I couldn’t wait on a receiver that could decode both AND do 7.1.4. I also strongly believe that any DTS: X blu-ray will play flawlessly, via the Dolby surround upmixer. In fact, I’ll almost guarantee that a DTS: X Blu-ray played back in DolbyAtmos (via Dolby surround) will sound almost identical to what it sounds like, when played back on a DTS: X receiver. After all, both formats are object based. And on top of that, this Denon 5200 plays DTS Neo: X Blu-rays better than my 4520 did. The only movie I’m aware of at the moment that will have a DTS:X track on the Blu-ray is Ex-Machina. I’ve got the upgrade itch but I’ve waited this long so I’ll just wait and see if Denon releases a receiver that can do 7.1.4 processing and decodes both Atmos and DTS:X. Thanks for the input. Hey experts! I’m getting the “itch” again and I have a question. I’m wanting to upgrade my blu ray player in my home theatre room to a better quality model, I can’t afford an OPPO but I’m thinking a top of the line Sony model would give me a boost, specifically one with 4k upscaling. Here’s my question: if a regular BD player offers 4k upscaling, do you need a 4k tv or (in my case) 4k Projector to take advantage of it? Or can you use the feature with a regular hd receiver and 1080p projector? If the player upconverts the picture to 4k, it will output a 4k video signal. If you send this to a display that is not capable of 4k, you will get nothing on screen. As far as upgrading your Blu-ray player, that depends on what exactly is wrong with your old player that you want to change. I’m currently running an uber-cheap sony player (not sure of the exact model number) into a pioneer vsx-820 receiver and then out to a Benq 1075 projector. The main issues I have with my player are the fact that it’s slow to load, doesn’t support 3d, and being that it’s the bargain basement sony model, probably doesn’t offer the kind of a/v quality of high end players. Based on your reply to my original question it sounds like I would either need a receiver that supports 4k and/or a 4k projector take take advantage of an upscaling feature of any player I purchase? Correct? You’d need a 4k display(TV)or 4k projector to see a 4k video signal. Every device in your signal chain needs to be capable of 4k. If you route the video through an AVR, then the player, the receiver and the projector all need to be compatible with 4k. However, if the player has two HDMI outputs, you should be able to route the video directly to your projector separately from your audio, which will go to the receiver. That would spare you a receiver upgrade (unless you want get get Dolby Atmos and DTS:X). As far as the A/V quality goes, there should not be much of any difference between Blu-ray players unless you want to go fiddling with the picture by adding DNR or sharpening or color manipulation. If you’re the type of tweaker who does that sort of thing, some players offer more controls than others in that regard. If, however, you just want the player to transmit what’s on the disc, pretty much any model should be capable of that. Likewise for audio. If you set the player for Bitstream, the player itself does absolutely nothing to the audio. What’s on the disc is what goes to the receiver. Loading speed and 3D support are legitimate reasons to want to upgrade. I’m personally only familiar with OPPO models, so I can’t comment on Sony. These days, I’m sure you can probably find something cheap that will give you 3D and be faster than your old player. Love your setup, I recently ditched my pioneer atmos add-ons because the atmos effect just wasn’t very good. I noticed you mounted speakers on your ceiling and I am thinking of doing the same since actual in-ceiling speakers is a no go due to no attic access. In your professional opinion, will this sound pretty good or even work for what I am trying to do. I have all polk monitor 70s and 40’s in my set up and will be using polk TL1’s for my atmos, aiming down via videosecu speaker mounts. Thanks again brotha, love your setup and home theater articles. I don’t have any experience with those specific speakers, but there shouldn’t be much sonic difference between mounting in the ceiling vs. mounting on the ceiling. Either should sound better than the add-on reflective modules. I’ve made another major Atmos upgrade to my system this week and will write more about it soon. I have made peace with having some wires showing and have decided to run a cord hider along my ceiling and down my back wall. Wont look pretty, but with the lights off who will see it lol. Thanks for the fast reply and I will update you once I mount em.